The iD14 and ASP800 bring console level recording to a whole new price point. Audient announced the latest in their family of products at Musikmesse- the iD14 High Performance USB Audio Interface and the ASP800 8 Channel Microphone Preamplifier and ADC with HMX & IRON. The iD14 streets at $299.99, and the ASP800 comes in at $799.99. That’s 10 channels of David Dearden designed Audient console pres right on your desktop or on location with you for just over $1k. Hard to top! Let’s take a look at the features of both units (or just take the plunge and buy them now at Chuck Levin’s! TheiD14 delivers the audio performance of a large format console in a compact and elegant desktop package. 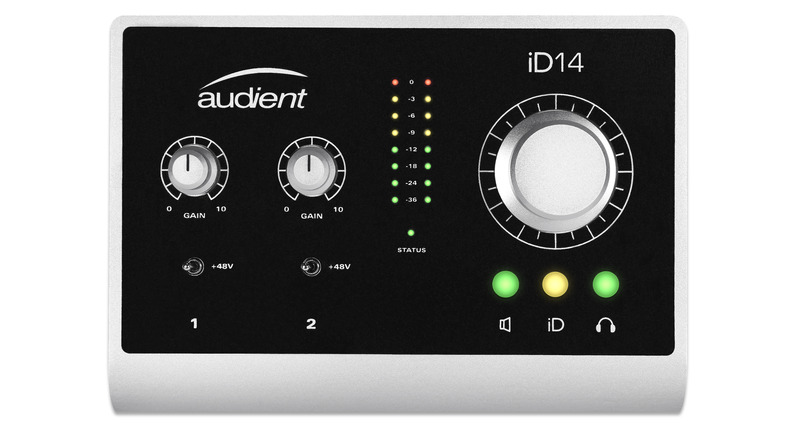 iD14 provides a pair of world-class Audient console mic pres, class-leading Burr Brown converter technology, console style monitor control, JFET D.I and the revolutionary ScrollControl. With its versatile feature set and intuitive layout, iD14 will become the hub of your studio in no time. The ASP800 is an audio powerhouse designed to transform your sessions into world class recordings, making it the perfect addition to your audio interface. ASP800 provides 8 channels of Audient’s renowned console mic preamps, class-leading Burr-Brown converter technology, two JFET D.I’s and two Retro channels with revolutionary tone control. Just plug in your mics, guitars, keyboards and drum machines and you’re ready to go, so get creative and start thinking big!